Tamales, tostadas, eggrolls, sambusa ... and lefse, of course! That's just some of the potluck fare people enjoyed at Pelican Rapids' International Friendship Festival, June 20-21. 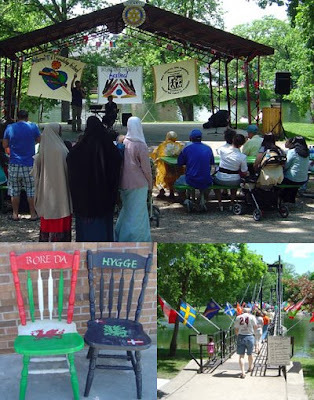 People lined up for the international smorgasbord, then sauntered across the flag-festooned suspension bridge to listen to music in the park and view several multicultural displays. Along the main street, stores displayed decorated chairs out front, each saying "welcome" in a different language. If you didn't get to Pelican Rapids this past weekend, the town's 125th anniversary and its annual Turkey Days is just around the corner, July 11-12. Interested in finding out about more festivals around the area? Explore Minnesota's Web site lets you search by region.